You’ve seen them at the fish market. Whole trout. Somewhat intimidating, but also intriguing. Friends, if you’ve never ventured in the world of whole fish, I highly recommend it. Cooking them is beyond easy and the flavor is exceptional. Today we stuff them with peppers, onions, and fresh lemons – flavors characteristic of Equatorial Guinea. Slightly spicy and super fresh – make this for a special occasion or just for fun. First things first. Light a candle. 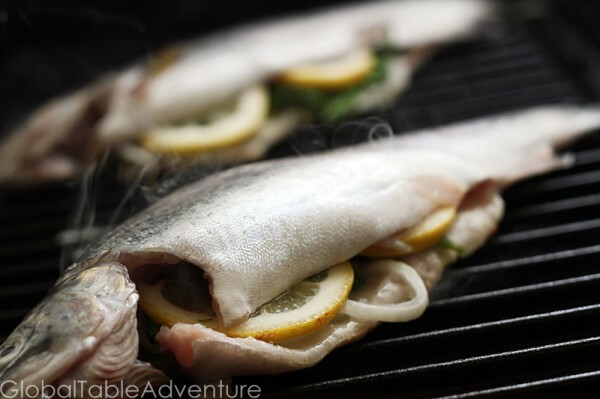 The flickering light is warm and inviting, and does a great job of eating up fish smells. I burn candles daily, fish or no fish. Gather your ingredients and preheat the grill to medium. You won’t need too much onion and pepper, unless your fish are huge. Rinse and pat dry the fish. 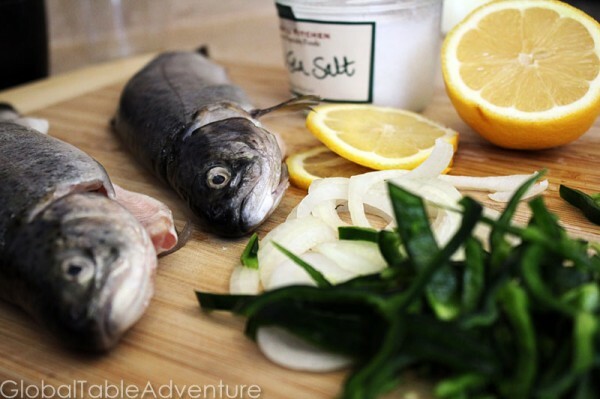 Then season the cavity with salt and pepper – preferably fresh, coarse sea salt. 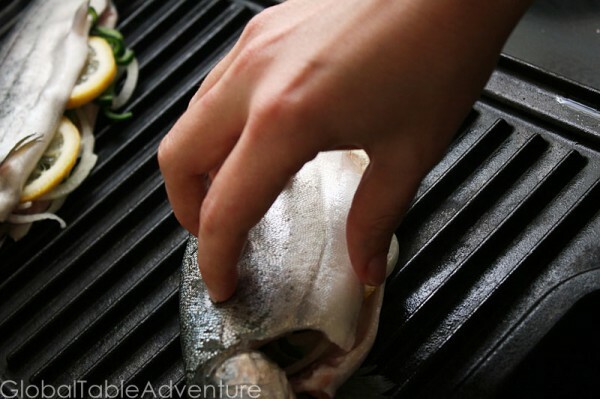 Carefully brush the preheated grill with a little oil and add the stuffed trout. … or until opaque and flaky. If you don’t fuss with it (poke it and prod it to see if it’s done) you’ll get beautiful grill marks. 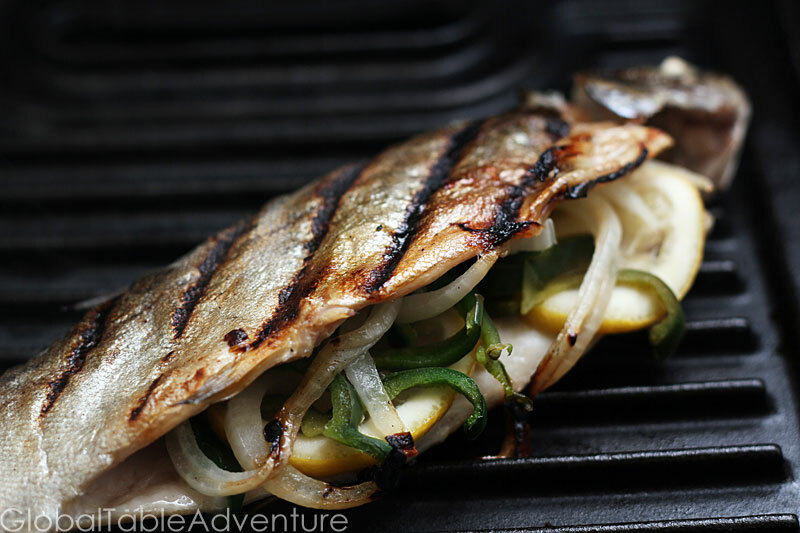 Mmm, fish and veggies … all in one! Serve with rice and a smile. 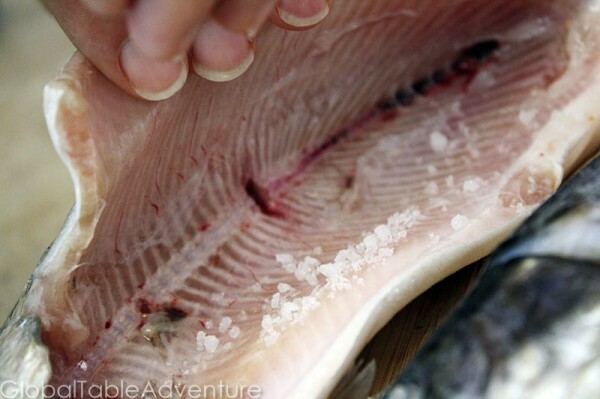 How I eat a whole fish: Peel skin back and simply eat the exposed fillet. 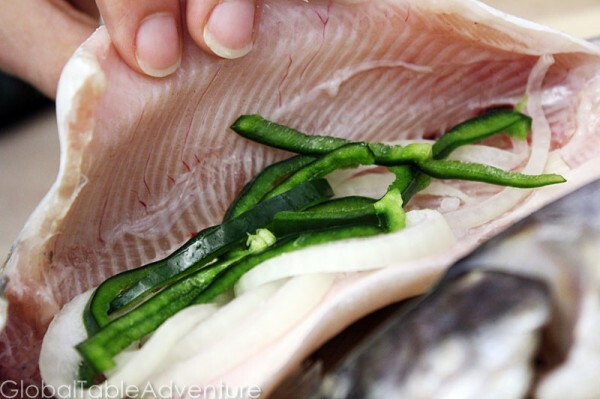 Watch out for the bones – they’re in the middle, under each fillet. Then flip the fish over and repeat. All the while, I pull out bits of filling to eat with the fish. Have you ever eaten whole fish? How do you eat one? Slightly spicy and super fresh - make this for a special occasion or just for fun. Rinse and pat dry the fish then season the cavity with salt and pepper. Add the onions, peppers and lemon slices to the cavity. 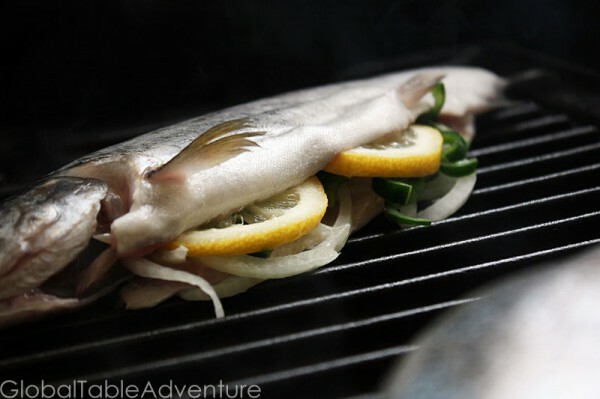 Brush the preheated grill with a little oil and add the stuffed trout. Cook each side for about 6 minutes or until opaque and flaky. That does look good. I am going to have to get Cliff into eating fish. I got used to the ‘whole fish on your plate’ thing when I was living in Korea. They’re fun to eat with chopsticks! Your fish looks delicious. I’ve cooked and eaten whole fish countless times, but it’s been a while since the last time… this was inspirational. 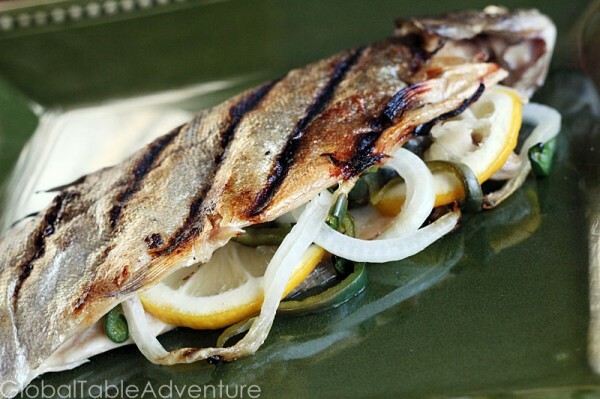 In younger years I used to go ice-fishing, and food doesn’t get much better than whole trout straight from the lake! We had whole trout quite often when I grew up. 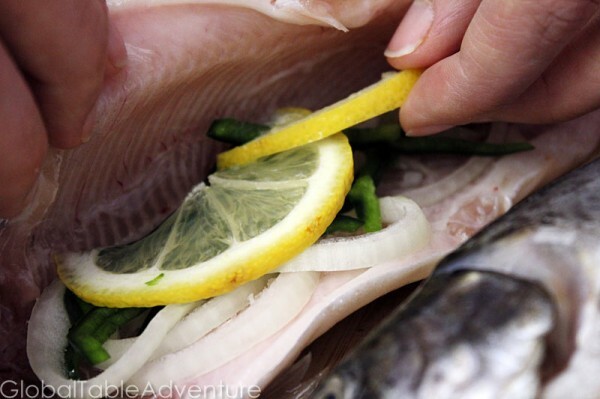 If you cut right along the backbone of the cooked trout, you can lift the filet off easily without any bones at all. This looks like a great recipe. I put “whole trout” on my shopping list. Nothing creepier than eating whole fish (except staring at raw frog legs). I’m of the same opinion! I’ve cooked and eat whole fish quite frequently, I basically eat it the same way you mentioned but I actually like to eat the skin too, it’s so flavorful.